POLSON — Amelia, Anna, Joseph, Lillian, Harold and Hattie Cronk are proud to announce the birth of their sister, Philomena Rose Cronk. She was born June 11, 2018, at the Nesting Place in Providence St. Joseph Medical Center. 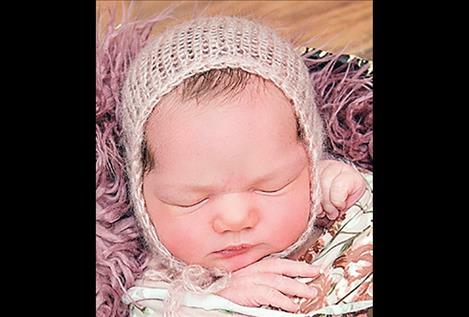 Philomena was 19 inches long and weighed 7 pounds, 5 ounces. Her parents are Jen and Lyle Cronk of St. Ignatius. Maternal grandparents are Jo and Lloyd Phillips. Paternal grandparent is Harold Cronk. POLSON — Florabelle, Augustus and Pearl Bagley announce the birth of their sister, Wendy Marian Verlee Bagley. Wendy was born June 19, 2018, at the Nesting Place in Providence St. Joseph Medical Center. She was 21 inches long and weighed 9 pounds, 7 ounces. Wendy’s parents are Jennifer and Skyler Bagley of Polson. Maternal grandparents are Robbin and Jeff Manship. Maternal greatgrandparents are Marian and Clark Wilkinson and Arlene and Darwin Manship. Paternal grandparents are Sue and Cleve Bagley. Paternal great-grandparents are Willa and Vivan Bagley, Emma Birks and Othie Young. 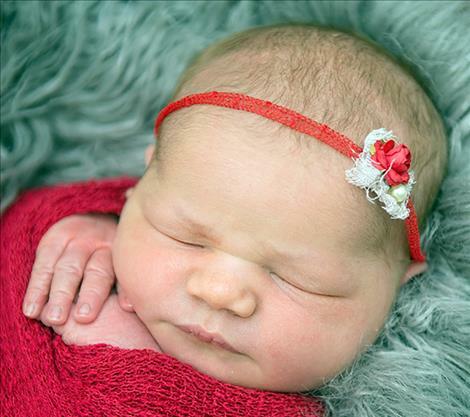 POLSON — Amelia Baer announces the birth of sister, Abigail Lynn Baer. Abigail was born June 1, 2018, at the Nesting Place at Providence St. Joseph Medical Center. She was 19 and threequarter inches long and weighed 8 pounds, 8 ounces. Abigail’s parents are Marni and Dawson Baer of Ronan. Maternal grandparents are Marion and Mike Wadsworth. Maternal great-grandparents are Clarice and Charles Collier. Paternal grandparents are Tammi and Monte Baer. Paternal great-grandparents are Ruby and Wayne Baer. POLSON — Aulora JaeLeiha Lefthand was born June 4, 2018, at the Nesting Place at Providence St. Joseph Medical Center. 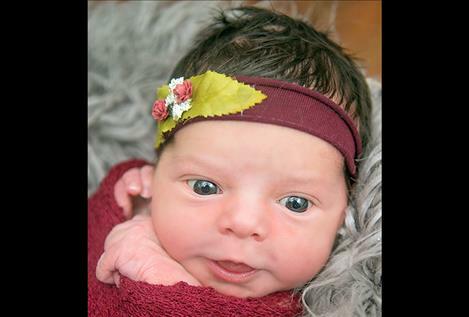 Aulora was 20 inches long and weighed 7 pounds, 13 ounces. 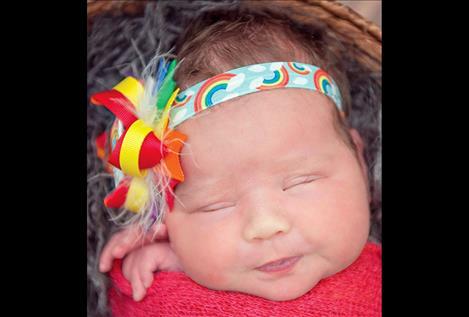 Her parents are Lauren Lefthand and Braden Youngren of Polson. Maternal grandparents are Renee Pierre and Patrick Leftland Jr. Maternal great-grandparents are Naida Lefthand and the late Marian Andrew. Paternal grandparents are Stephanie Irvine and Brian Youngren. Paternal great-grandparent is Carrie Irvine. 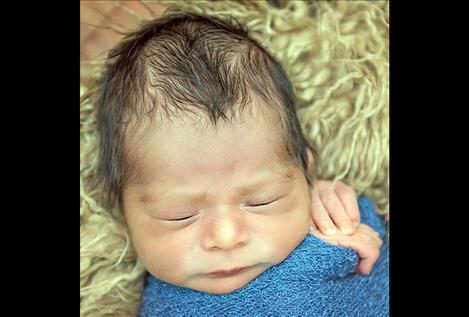 POLSON — Jaxen Sandberg announces the birth of sister, Olivia Josephine Sandberg. 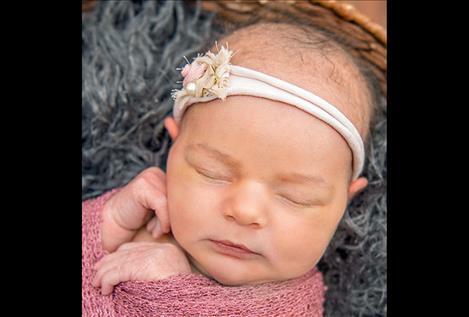 Olivia was born June 3, 2018, at the Nesting Place in Providence St. Joseph Medical Center. 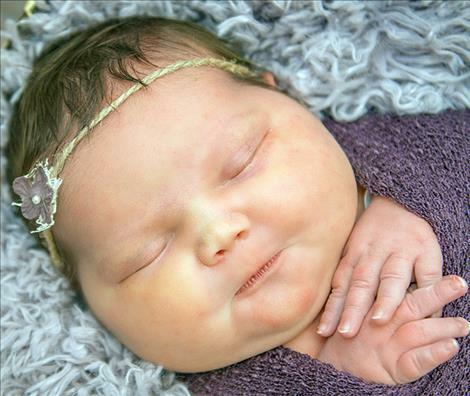 She was 20 and one-half inches long and weighed 9 pounds, 6.8 ounces. Olivia’s parents are MaryJo and Matt Sandberg of Polson. Maternal grandparent is Beverly Timentwa. Maternal great-grandparents are Mary and Tim Parsons. Paternal grandparents are Tammy and Hank Sandberg and Dorrie Sandberg. Paternal great-grandparents are Barb and Doc Sandberg and Linda Pulse. 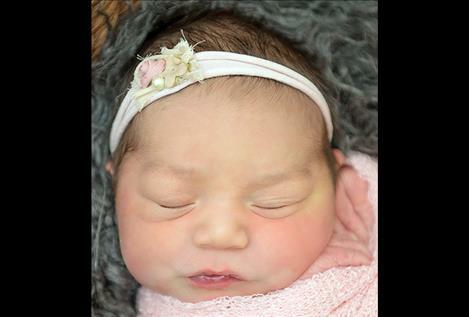 POLSON — Javier Hendricks is excited to announce the birth of sister, Serephine Jo Elizabeth Hendricks. She was born May 29, 2018 to Erin and Antonio Hendricks of Polson. Serephine was 18 and onehalf inches long and weighed 7 pounds, 3 ounces. Maternal grandparents are Silvia and Chuck Martin and Cheri Haggi and Dan Cassidy. Paternal grandparents are Judy and Juni Holms. Paternal great-grandparents are Claudia and Robert Hendricks. POLSON — Zoey Vivian Billedeaux was born May 28, 2018 at the Nesting Place in Providence St. Joseph Medical Center. Zoey was 19 inches long and weighed 9 pounds, 5 ounces. Her mother is Willamena Billedeaux. Maternal grandparents are Mary Jane and Dwight Billedeaux. Maternal great-grandparent is Ethel Mae Billedeaux. POLSON — Dreyson Daniel David OldPerson was born May 9, 2018, at the Nesting Place in Providence St. Joseph Medical Center. He was 19 and one-half inches long and weighed 6 pounds, 8 ounces. Dreyson’s parents are Malina Bourdon and Daniel OldPerson of St. Ignatius. Dreyson joins siblings Cynthia, DeLonte, Sunshine, Fancee and Montana in the OldPerson Home. Maternal grandparent is Dorene Bourdon. Maternal great-grandparent is Loren Zackuse. Paternal grandparents is Melinda OldPerson. Paternal great-grandparent is Elanore OldPerson.